This is an excerpt from the new e-book “Concrete Staining Today,” part of a series of reports from ConcreteNetwork.com on trends and insights about decorative concrete applications. 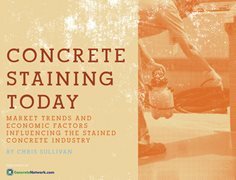 Discover four emerging trends in concrete staining from ConcreteNetwork.com’s new e-book. You’ll also get insights and advice from veteran installers that will help you stay profitable in today’s market. Stained concrete is a unique market in that it blends the historically conservative nature of the concrete stain palette with the demands of the fast-paced and always changing flooring and color industries. This sets up an interesting dynamic where the traditional look of concrete stain is now feeling the pressure of the ever-changing color and pattern trends generated from the commercial flooring industry. This pressure has created a division within the staining industry, as the traditionalist holds true to the time-honored look of acid-stained concrete, with its earth-tone marbled hues and variegated translucent finishes, while the new generation of installers embraces the new easy-to-use media and bright colors that have made their way into the mainstream. I see this as less of a struggle and more of a coalescence of the old and new to form a concrete staining stain industry that sets trends as well as follows them. A broader color paletteColor once defined the stained concrete industry, and for decades the same terra cotta range of earth-tone colors identified the floor as stained concrete. This brand identity has served the stained concrete industry well, but is giving way to new color trends. “Spicy earth-tone colors are coming to the end of the design cycle,” says Shelly Rigsby, owner of Acanthus/Concrete Stain Designs, Dallas. “We are beginning to see cleaner, brighter, and lighter colors being used.” The growth of new stain technology is both a cause and effect of the brighter and lighter color trend. With the introduction of new concrete dyes and acrylic-based stains, the stained concrete industry can now meet the demands of new color trends while allowing installers to get creative with new colors and create new looks. The phrase “every job is unique and one-of-a-kind” has become a staple in the stained concrete industry. Most stains work to enhance the natural variations of the concrete or cement-based topping they are applied to. This allows the installer to create something distinctive by taking advantage of the natural variations in the substrate. These natural and unique marbling effects have been taken to a new level with the introduction of new stain and dye technology. Now contractors are blending different stain media to achieve colors and finishes that are even more unique then those previously obtained from classic acid-based stains alone. Rigsby calls this trend “multi-media.” She uses different colors from different stain media to achieve new and distinctive looks exclusive to her. Some projects also use other media, such as glass or metal that is seeded into the concrete, to create distinctive visual textures with the stain adding even a higher level of color and visual impact. This new multi-media approach is also prevalent in the work of Hyde Concrete, Annapolis, Md. “We use a little bit of everything in our work,” says owner Greg Hyde. He likes blending and layering different types of stains to obtain one-of-a-kind look for his clients. New applicationsAnother trend in the stained concrete industry is where stains and dyes are now being used. The rapid growth in the popularity of polished concrete industry has been a boon for the stain industry in recent years. Because of their tinting strength and ability to penetrate deeply into concrete, concrete dyes have become the go-to product when coloring polished concrete floors. “Less stained concrete and more polished and dyed concrete is the trend,” says Tim Fisher, owner of Fisher’s Concrete Company, Louisville, Colo. He says that his customers are leaning toward the clean look of polished concrete with the expanded color palette of concrete dyes. “Five out of ten prospective customers who come to look at stained concrete, leave with a polished floor,” he says. More competitionAs with any growth industry, the more popular something becomes, the more people who are attracted to it. An unfortunate trend, according to most of the installers I spoke with, is the influx of unskilled installers entering the concrete staining industry. “It’s not the responsibility of the client to pay for you to learn,” says Rigsby. While staining concrete may look easy, obtaining a top-quality product requires years of experience. The industry has seen a flood of installers producing poor work in recent years, which has an overall negative effect on the industry. Increased numbers of poorly trained installers has also led to price erosion in the stained concrete industry in all regions of the country over the last few years. With the increase in the number of installers has come a decrease in the price per square foot. In some areas, the price erosion has become so bad that companies are getting out of the industry entirely. “Good installers are being chased out by low cost competition,” Rigsby points out. The stain industry has a very low barrier to entry and products are readily available, but this does not necessarily equate to quality work. I encourage all professional stain installers to promote yourself, your work, and your experience through a website that includes reliable references. If you’re going to be successful staining concrete long-term, you need to get trained and set yourself apart from the rest of the industry. A greater emphasis on surface preparationA more recent trend in the stained concrete industry involves surface preparation, a less talked about part of staining yet one that is critical to the final outcome and look of the floor. One of the reasons the stain industry suffered a setback in the early to mid-2000s was because of a chronic outbreak of stain failures mostly caused by the perception that stain application consisted of spray, seal, and walk away and the misconception that stain would work on any concrete surface in any condition. Education and experience caught up with the industry and surface preparation soon became a big part of every staining project. Today most professional stain installers incorporate some form of surface preparation into all of their staining jobs. “It is hard to find concrete in good shape to stain,” says Fisher. Hyde agrees and grinds all concrete before applying stains. The idea of grinding or honing the concrete prior to staining was unheard of a decade ago, but now is a growing trend. The process of grinding removes the top layer of concrete paste, eliminating contamination and other foreign material that can create a blemish on a stained floor. It also creates a uniform surface that allows the installer to have more control of the staining process. Another trend dealing with surface preparation prior to staining is the use of overlays. Cement-based thin sections or microtoppings have been around for a long time, used as both a stand-alone surface and for use as a new palette for stained floors. But in recent years, they have gained in popularity as a method for surface preparation prior to staining. Fisher prefers to apply stain to overlays versus concrete because of the control it gives him in the color and finish. He admits, however, that using an overlay doubles the price per square foot of his work when compared to staining plain concrete. In contrast, Rigsby only works with overlays when they are absolutely required. “Attention to detail is critical with an overlay so it appears natural versus sloppy and unreliable,” she says. No matter your preferred method of surface preparation, the fact is that doing nothing to the surface of the concrete prior to staining is no longer an accepted method.